What to do when your travel plans hit a bump in the road. I was on my way to the airport and thinking about the next 16 days that lay ahead of me. 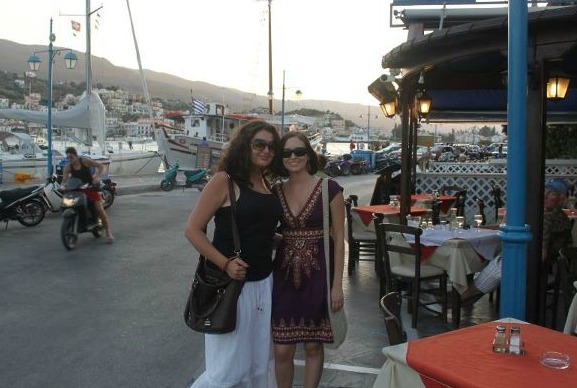 I was excited that soon I’d be in Rome, Italy meeting up with my friend, Stacy for an exciting romp around Italy and Greece. All that was between me and having Stacy run into my arms (we planned beforehand that she would) was a one-hour connection in Philadelphia and an 8-hour plane ride to Rome. 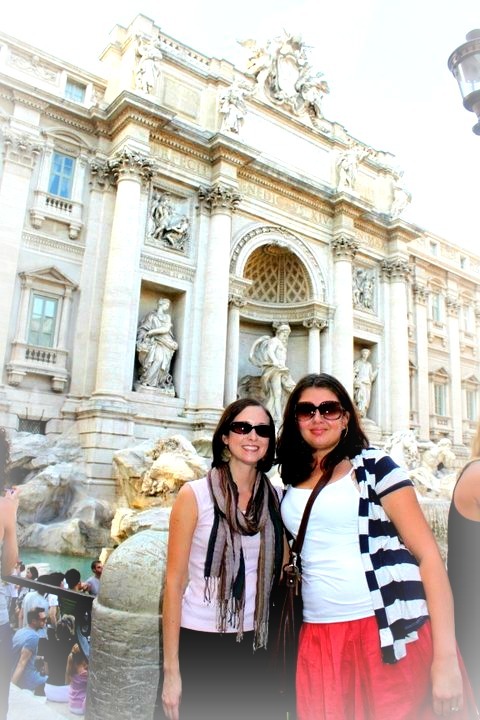 Stacy and I pose in front of the Trevi fountain on our first official day in Rome. It wasn’t long before my optimism was popped by the sharp tip of reality. As we’re circling the airport in Philly the captain informs us that we’re unable to land due to weather. Combine that with the most turbulent flight I’ve ever been on and the black clouds that greeted me every time I looked out the window and the situation was not looking good. Needless to say I was a little worried about both missing my connection and plummeting to my death. At that time, I still had an hour before my connection and the flight attendant assured me that I was fine. When we finally landed that hour had dwindled to 15 minutes. I ran to my gate (which was on the other side of the airport, of course) only to find that I had missed my flight by only a few minutes. I could still see the plane out the window taunting me. I then took my sweaty, red-faced, gasping-for-air self to the bathroom to catch my breath and curse. I was able to get on another flight that left three hours later with a layover in London. So instead of arriving in Rome at 9:30 a.m. I was getting there at 3:55 p.m., not so bad. After getting my new boarding passes, I found a wine bar where I sulked over cheesecake and Merlot. Once on board the plane, I was glad to see I had an aisle seat with extra legroom. However, as soon as I sat down a man with a baby asked me and my neighbor if we would mind switching seats with him and his wife. Apparently they could fit a bassinet at our seats for their child to sleep. He even brought the baby over as ammunition. We both conceded and I found my self crunched in-between two men with very little room and regretting all that wine I had just drank. After very little sleep, listening to some music and judging the English-man to my left for not crying after “Marley & Me” we landed in London and I was off to my next adventure. The London portion of my journey wasn’t too bad. I enjoyed some coffee and window-shopped before boarding for Rome. I even found an ATM and thought it’d be a great idea to get some cash. Obviously, I had totally forgotten that London’s currency is not the same as many other European countries (London uses pounds while Italy uses euros). So with a pocketful of incorrect currency and excitement of being so close to the end of my journey I boarded a plane for Rome. I look back at this moment and laugh because little did I know my ordeal was far from over. 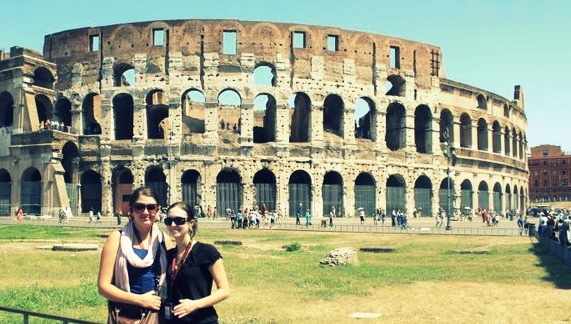 Me and Stacy in front of the Coliseum in Rome. Originally, Stacy and I were scheduled to land in Rome only 30 minutes apart and had planned to meet at the Delta kiosk (we assumed there would be one). However, I had not planned on missing my connection in Philly nor had we planned that Stacy’s phone would break making it impossible for me to let her know of my new itinerary. I tried not to worry. I assumed Stacy would check with my airline upon landing, learn of the new developments and wait for me where we had planned. This was not the case. First of all, the only Delta kiosk was about a 10-minute bus ride away from the airport and looked like a ghost town. Needless to say, Stacy was not there. I then went back to the main building and walked around for four hours looking for my dear friend. Day was quickly turning to night so in an act of sheer desperation I switched my phone into roaming mode (still haven’t had the guts to check out the bill) and made contact with Stacy’s sister who informed me that Stacy was at the hotel. I happily said ciao to the Leonardo da Vinci-Fiumicino Airport and caught a cab to the hotel. My cab driver did not speak English so when I attempted to pay him I had no idea why he wouldn’t take my money. This is when I first realized that I had a wallet full of pounds, not euros. After paying the driver with the appropriate currency, thanks to Stacy, and nursing the blister that had formed on my big toe, Stacy and I celebrated being together in Rome (finally) and were more than happy to put the ordeal behind us. We celebrated with a bottle of wine over dinner then passed out with a renewed sense of hope for the coming days. While the first day of my trip didn’t go as smoothly as I had hoped I learned a few lessons for my future travels and am more than happy to share. 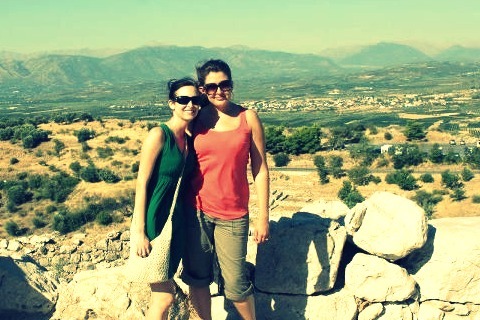 Me and Stacy enjoying the beauty of Greece. Anticipate snags – It’s natural to have the highest of hopes at the start of your vacation but try and be prepared for the bumps that lay ahead. Be aware of the possibility of missing your flight or losing you luggage. If none of those things happen then great. However, if you do encounter those mishaps it won’t be such a blow if you were already aware of the possibility. Be Proactive– While unfortunate things do happen while traveling there’s no reason you can’t try and turn the tables in your favor. If your flight is behind schedule and you have a connection to make then let your flight attendant know, they may be able to help get you to your gate quicker. Pack essentials in your carry-on just in case your luggage does get misplaced. Taking a breath and thinking things out may be your best hope in staying true to your original travel plans. Nothing is a guarantee but it’s always worth a try and sometimes it really pays off. Be nice – Even though your plans aren’t turning out the way you had hoped still be polite and courteous to others. It is no one’s fault that your plans have changed. Being rude to others certainly will not change your dilemma and you’ll have made another persons day a little more stressful. Have a back up plan– Actually, have several backup plans because your first one may not pan out. Stacy and I had a plan that obviously didn’t work. Had we come up with a “Plan B” ahead of time then perhaps our first day in Rome would have been much different. Relax – Freaking out isn’t going to change your situation but will make you more miserable. Give yourself a couple of minutes to sulk, cry or curse then move on. Focus of what needs to be done to minimize the damage and be productive. Re-book your flight, contact the appropriate people to inform them of your new schedule, fine-tune your itinerary, or practice more of the language you’ll soon be immersed in. Just don’t let frustration get the best of you when you still have control over so much. Look at the bright side – In our original plan, Stacy and I were supposed to be sipping latte’s at a sidewalk cafe in Rome by noon on our first day in Italy. In reality, I was just touching down in London and Stacy was wondering the airport in Rome all by her lonesome. While our original plans didn’t turn out as we had hoped, we still had an interesting day and enough stories to last us a lifetime. We had both met new and interesting people and had plenty to talk (and laugh) about during our first dinner together in Rome. I’m back in the good ole’ U S of A and have the best memories of my trip with a dear friend. Those snags at the beginning of the trip that seemed so major at the time had little impact on our trip as a whole. In the end, we had that latte in Rome and that’s all that matters.